When I found this onion, I was so excited. First, I loved the name. It instantly reminded me of the 80’s Bangles Song, “Walk Like An Egyptian”, and began running through my head, which compelled me to make sure I had it in my iTunes library, and then play it. A perennial vegetable with such descriptive name that conjured up such memories was worth exploring. Next, I fell in love with this onion because of its look, which is so unique. 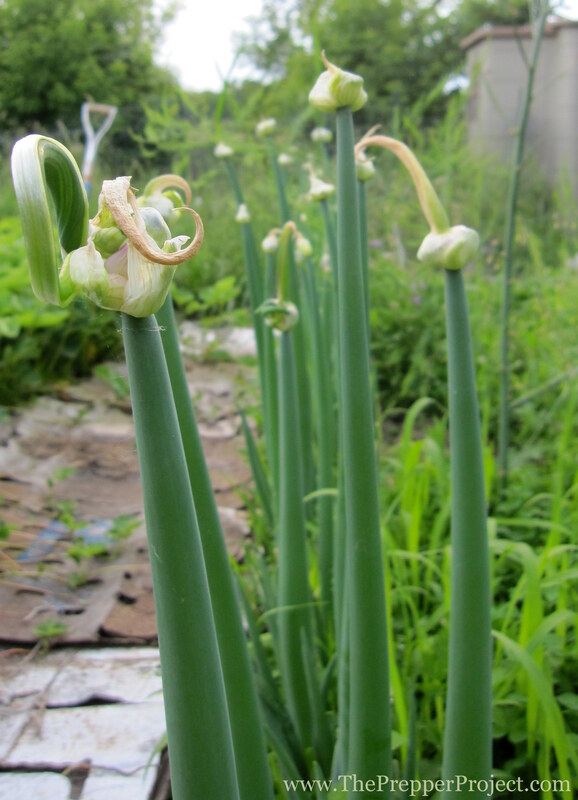 The way this onion bulbs at the top, then bends over to re-root (or “walks”) is fascinating. It adds interest to any landscape whether or not you choose to grow it for eating or just for show. 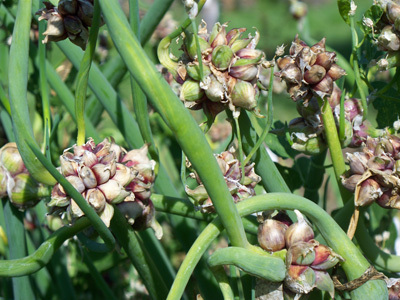 Egyptian onions are hardy perennials that can be grown in most regions of the country. 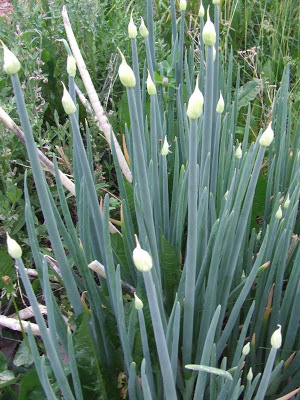 They reach up to three feet tall and form clusters of small onion bulbs at the top of the stem. Eventually, the weight of the bulb clusters causes the stem to bend to the ground. The bulbs root and produce new shoots, starting the process over again. 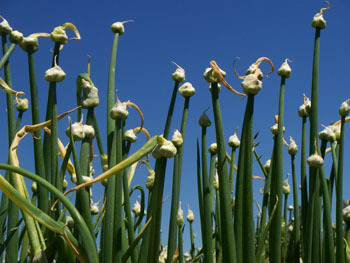 Walking onions can live with roses and strawberries in a flowerbed, or be grown in a mixed border for an unusual effect. Roses love onions, and planting some in your rose garden may increase the perfume, ward off aphid infestations and repel the dreaded black spot. 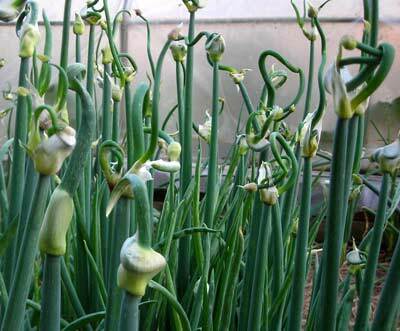 Because onions have pest repellant properties, you can also plant them around fruit trees and bushes. They’re a great part of a perennial polyculture. 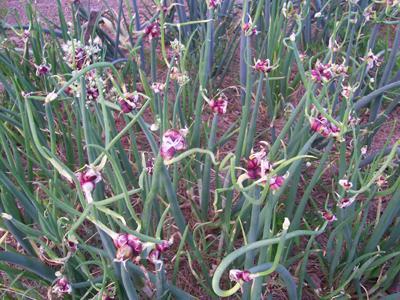 There is a lot of variation in Egyptian Walking Onion plants. Some plants form long, twisting branches and very few topsets, while others produce large clusters of topsets and no branches. Some plants grow only 2 topsets and others will grow 30. Every plant is so unique and beautiful. To control their somewhat haphazard propagation, simply remove some of the bulbs and plant them where you’d like the next crop of onions to grow. This is a very easy perennial vegetable to put into your garden, and it doesn’t take up mammoth space. Choose a sunny area with well-drained, moist soil. They can be planted any time of the year even in the winter as long as the ground isn’t frozen or covered with snow. However, fall is the optimal time to plant them so they can develop a strong root system and be ready for good growth the following spring. The plants die back to look scruffy over the winter, but very early in the spring new green shoots emerge from the brownish bases. Like other onions, the leaves are hollow. The red or purple bulbs are only slightly enlarged from the stem, and about an inch long. 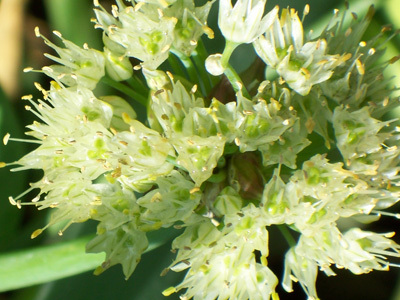 By late spring and into early summer heavy spikes are produced that grow up to 2 feet tall and on which the bulbils are borne. These bulbils start out tiny and green, but eventually grow larger with reddish to brown skins.